We’ve made available for download a Te Reo Māori Kaizen 5S Methodology Poster to improve operational performance and efficiency, you can download it here. This translation was developed to suit a continuous improvement program using Māori terms based on the Kaizen 5S process to embrace the diversity of Aotearoa and can be implemented across the workplace. Successful companies across the globe have implemented lean management techniques to improve efficiency and profitability, and New Zealand is no exception. One of the most accessible interpretations of a lean management philosophy is kaizen (lit. change for better) – practiced in Japan after WWII by companies like Toyota. Kaizen can be easily implemented via the workplace organisation 5S method that uses five Japanese words to organise a workspace for effectiveness and efficiency. When transliterated into latin script, each word from the Japanese language begins with the letter “S”: seiri, seiton, seiso, seiketsu, and shitsuke. These have subsequently been translated into English as: “Sort”, “Set In Order”, “Shine”, “Standardise” and “Sustain”. Additionally, the element of “Safety” has been added over time and now forms the foundation of an 6S or 5S+1 workplace. However you say these five actions, just be sure to do them—regularly… Regardless of the language used to describe it, a clean and orderly office or production floor speaks for itself. As one of two official verbal languages of New Zealand, it is surprising that there is not more resource available in te reo. And what is most surprising is how easy it is to apply the principles of continuous improvement into the language. Unlike in the English language, there is no letter ‘S’ in Māori so not having to shoehorn in words beginning with with that letter opens up possibilities. When looking for the best words to use, we need to look for another letter/sound to accommodate the principles of 6S process improvement. And there is a great one ‘wh’. In te reo, the pronunciation of vowels and consonants is quite straightforward – with a little practice and there are a number of resources available online to help. However, one that most people living in or visiting New Zealand will be aware of is that the digraph “wh”, usually pronounced as an f.
So pronouncing sounds like whaka- can often cause some sniggers as, to English speakers, it can sound rude. But this particular word is very powerful. Whaka- can be prefixed to adjectives and verbs ‘to cause something to happen’ or to move towards an outcome and is the basis of many verbs. As a result, translating the 5S/6S steps into te reo becomes straightforward and there are a wealth of words that can be used to represent the steps. The result leads to workers embracing the methodology generates positive discussions. 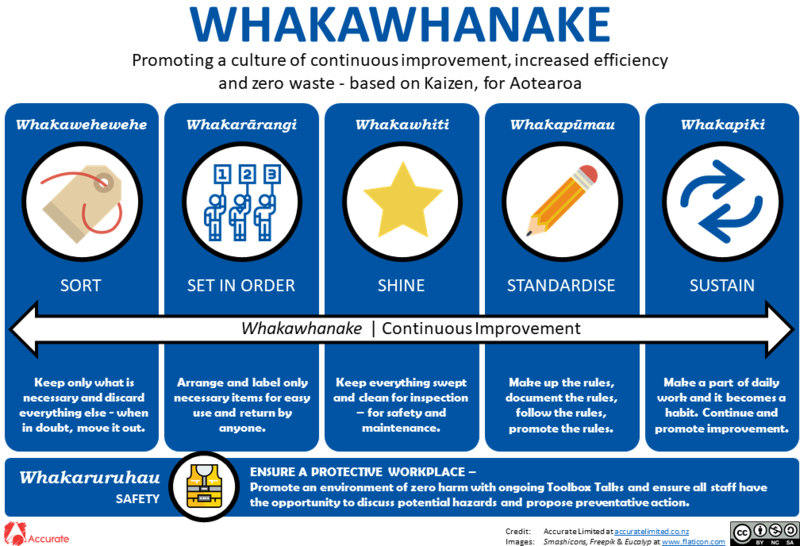 If you’ve already seen the poster, with the included pronunciation guide, you’d have noticed that whakawhanake is the term used to describe continuous improvement (N.B. ISO9001 refers to thsi as continual improvement) and other words beginning with ‘whaka’ were used to indicate the steps. (verb) to refine, improve, perfect, polish. (noun) refinement, improvement, perfection, polishing. (intransitive verb) to favour one over the other, treat differently, discriminate. 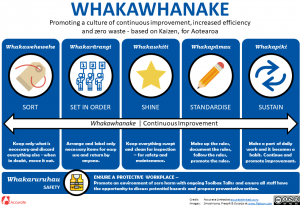 Whakapai is a very powerful word, therefore, and it would be possible to build an entire improvement programme based on this word alone and Whakapai could be used to describe most of the Kaizen steps using the above definitions. However, it was because of this very flexibility that it was excluded; as its usage could be confusing. (verb) (-tia) to develop, improve. Nevertheless, whakapai is a word that should be remembered and be used as a direction to refine each step further. Whakaono and Whakarima are words which do not exist in te reo and have been created to replicate the 5S and 6S terms (5/6 whakas). Ono means six (6), and Rima means five (5) whilst whaka– is a particle prefix added to verbs and adjectives to indicate ‘causing something to happen’. In te reo, writing 6 Whakas should be written as “e ono (6) nga whaka” – which is a bit of a mouthful. A word construct of whakaono, instead, implies ‘causing 6 actions to happen’. Whakapai could have been used as a word for step one or step two. However, whakawehewehe was chosen due to its meaning that best reflects the continual improvement task. (verb) (-a) to separate, divide, sort out. The work area should be cleared of unneeded items such as documents or tools. Only those items that are needed should be stored directly on the work surface. All unnecessary items should be removed and discarded. Usually, this is done using a red tag (tūtohu whero) or items placed in separate red tag area / place ready for disposal. Whakararangi was chosen to signify the second step over other options including whakapai ([verb] (-a,-hia,-ngia,-tia) to make good, set in order, prepare) and whakaraupapa ([verb] (-tia) to sequence, arrange in order, list). (verb) (-tia) to arrange in a line or row, catalogue. Items that are needed in the work area should be stored in an orderly manner. This makes it easier to find the tool and to quickly notice if a tool is missing at the end of a work shift. This is often done by assigning items to specific locations with clearly marked locations for each item. Whakaraupapa would have been a suitable term to use for this task. However, Whakararangi has the additional meaning of “line-out (rugby)” and so provides additional benefits for presenting to staff and further embedding the idea into New Zealand’s sports culture. The work area should be completely cleaned: waste, dirt, stains and debris should be removed from desks, work areas and machines. This results in a much more professional-looking work area, reduced clutter and improved efficiency. Again, whakapai ake could have been used in this example to indicate it’s meaning of ‘polish’ but would again have been confusing as it could easily be used for other steps. The Japanese term means to “clean up”, and like in English, there is no term beginning with whaka- to really signify this. Mā can mean “to whiten, clean” but using Whakamā in this context isn’t really appropriate for most situations. Another bonus for using whakawhiti is that whiti is also a loan word from English meaning ‘fit’. The term can therefore be introduced as making a work-station fit for work and helps with introducing the term to staff. Individual workstations should be set up according to the same standard. This makes it easier to find tools and results in an orderly appearance in the workplace. This can be done by making up the rules, documenting the rules and continuing the promotion of the rules. The Japanese term of seiketsu actually means “personal cleanliness”, the te reo term used here better reflects the what action is being taken after the initial steps. Once the steps have been started, they must be continued and promoted to ensure continual / continuous improvement within the workplace. Whakaono is not a once-a-year or one-off action. It is a methodology that should be repeated regularly. Equipment should be put away when it’s not needed, and cleaning must be performed regularly. Self-discipline is needed, and a regular schedule could also be helpful. The Japanese term of shitsuke means “(personal) discipline” indicating the challenge for staff. The te reo term used was chosen to indicate the importance of continuing for a wider purpose. (verb) (-tia) to cause to ascend, promote, support. A number of options were chosen to reflect this step including Whakatuarā ([verb] to support, back, champion, promote, help) which sounds suitable for this purpose. However, a word that implies improvement and climbing (to a higher point) is used instead. One of the central themes of any continual improvement is the safety of all works for efficiency, which is why the importance of safety has been added in most implementations in recent years. It is an underlying theme in any improvement process and is the foundation of a safe workplace. It is not, therefore, the sixth step. But rather, the consideration that precedes all others. The above meaning indicates a protective shield. An alternative option was whakamaru ([verb] (-hia,-ngia,-tia) to protect, shelter) which instead indicates a protector. However, either could be used. Whakawhanake Hear Example CONTINUOUS IMPROVEMENT Review processes continuously to ensure efficiency and best practice. Whakawehewehe Hear Example SORT Keep only what is necessary and discard everything else – when in doubt, move it out. Whakarārangi Hear Example SET IN ORDER Arrange and label only necessary items for easy use and return by anyone. Whakawhiti Hear Example SHINE Keep everything swept and clean for inspection – for safety and maintenance. Whakapūmau Hear Example STANDARDISE Make up the rules, document the rules, follow the rules, promote the rules. Whakapiki Hear Example SUSTAIN Make a part of daily work and it becomes a habit. Continue and promote improvement. Hear Example SAFETY Promote an environment of zero harm with ongoing Toolbox Talks and ensure all staff have the opportunity to discuss potential hazards and propose preventative action. Whakarima Hear Example 5S A word construct to indicate “5 Whakas”. In Te Reo Māori, this would normally be written as “e rima (5) nga whaka”. A word construct in this manner also implies ‘causing 5 actions to happen’. Whakaono Hear Example 6S A word construct to indicate “6 Whakas”. In Te Reo Māori, this would normally be written as “e ono (6) nga whaka”. A word construct in this manner also implies ‘causing 6 actions to happen’.